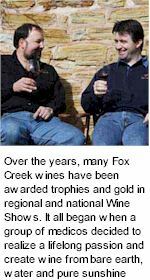 In the past years since Fox Creek was established, many of the Fox Creek wines have been recognized by being awarded both Trophies and Gold Medals from National and Regional Wine Shows. The McLaren Vale Region has a Mediterranean style climate with a strong maritime influence and is frost-free as we are 7km from the sea. Annual Rainfall is 600-700mm falling mainly in Winter. It is an ideal location for growing grapes, with little disease pressure. Fox Creek has three company vineyards or approximately 60 hectares of vines. The vineyards are within a range of 5 kilometres, near the village of Willunga. "On our vineyards we grow most common grape varieties. The red varieties are our specialty, Shiraz and Cabernet Sauvignon, Cabernet Franc and Merlot. The white varieties grown are Chardonnay, Sauvignon Blanc, Verdelho and Semillon. "Fox Creek has always protected and enhanced the areas surrounding the vineyards with plantings of indigenous native trees. These provide habitat, food and shelter for native birds. Our focus is to be environmentally friendly and only use sustainable practices if possible. We strive to minimise the use of any chemical or other artificial agents." There are many different soil types at the estate vineyards. About one half are black cracking clays full of organic matter which can develop deep cracks in summer. The rest are red sandy loams with rocks right through their profile. These soils are well drained and aerated. 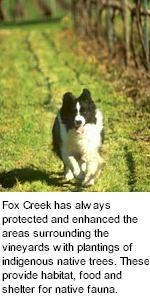 Fox Creek manage the vineyard floor with a mix of cover cropping and permanent swards. Mulching the under-vine area is also carried out to improve the structure, fertility and microbiological diversity in soil. Cultivation is kept to a bare minimum to conserve soil structure. The vineyard layout and trellis systems have been designed to best suit the specific needs of individual varieties. Most of the Shiraz is grown on a trellis system called Scott-Henry, and the vines are trained to two cordons. The shoots from the top cordon are lifted by a set of foliage wires while the bottom cordon shoots are down-turned. This system helps control the natural vigour of Shiraz while allowing maximum sunlight penetration and ventilation of the canopy. Most white varieties are grown on a Vertically Shoot Positioned trellis. This gives excellent fruit exposure and ventilation to reduce disease pressure, but enough shading to prevent sunburn damage to the bunches. With the use of weather stations and continuous monitoring of soil moisture, stress can be minimalized in critical periods such as the time of flowering, controlled stress is utilized to dictate shoot size after fruitset. The outcome of this careful management is to make the most efficient use of limited underground water supplies. All the estate vineyards have drip irrigation, with the exception of one premiere dry-grown Shiraz vineyard. "All of our vineyards are hand pruned to control vigour. Hand pruning also controls cropping levels which are kept quite low, enabling us to produce small berries full of concentrated flavour and colour. Vintage time is always hectic!" The winemakers sample the grapes regularly to determine the optimum picking time as judged by flavour development and baum (sugar levels).